We sell and ship Billy Goat Grazor Parts! Harsh weather, traffic, and UV rays deteriorate paved asphalt surfaces over time. Sealcoating preserves asphalt by applying a sealer to the pavement preventing damage and oxidation. This periodic maintenance can extend the life of asphalt for up to 30 years. Prior to sealcoating, the surface, including any cracks or concrete joints, must be thoroughly cleaned removing all dirt and vegetation. 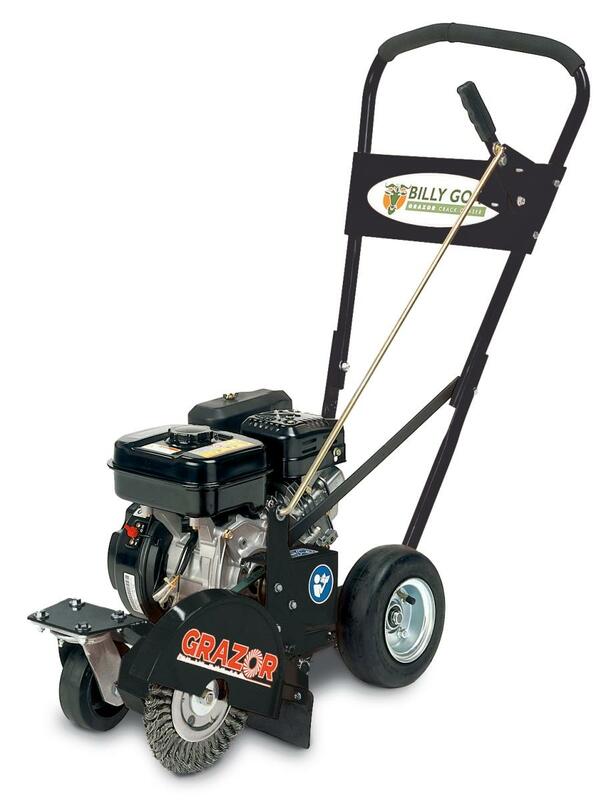 The Billy Goat Grazor is the perfect tool for preparing surfaces for sealcoating. A replaceable 8 inch brush made of solid steel wire cleanly removes debris and vegetation from cracks giving the crack filler optimum adhesion. The wire brush is self-sharpening when flipped and remounted in the reverse direction. The Grazor is powered by a Briggs, Subaru, or Honda engine allowing it to rip through asphalt cracks at the rate of 5 feet every 15 seconds. 6 different depth settings can be chosen easily with the fingertip control. Power is easily transferred to the wire brush through the Remote Brush Declutch. 8 inch semi-pneumatic tires mount at the rear of the wide platform ensuring stability during the toughest job. Heavy-duty swivel front caster wheels provide maximum maneuverability for twisting, crooked cracks. OEM replacement parts are readily available from BillyGoatParts.com for your Billy Goat Grazor. An online parts lookup tool makes finding needed replacement parts a cinch, getting you back to the job quickly.